We are full licensed company by LHDC - This allows us to meet certain standards and set benchmarks within the Ladakh Tourism Industry. We are copyright registered and are established as a long term in Tourism Business. 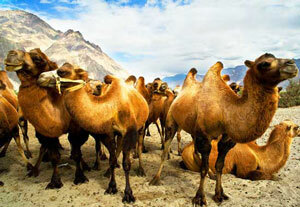 Travel with us to be ensured you will not go through any brokers and we assure you for the best of Ladakh experince. Arrival at Leh airport and transferred to the Hotel. Delhi to Leh fight is an hours spectacular over the Pan-himalayas, you can take nice early morning picture sun touching the horizon and the magnificent mountain view. As soon as you get out of the airport our representative will guide you to the hotel, there a welcome drink and traditional white scarf welcome will be hosted by the hotel reception. Since your ascending form 200 to 3500 Meters. form the sea level you need a Complete day for Acclimatise. Later evening visit to Leh Market, Leh Palace and Shanti Stupa. O/N Leh. After breakfast leave for visit to Shey Palace, Thiksey, Hemis monasteries, Stok Palace Museum & Sindhu Ghat. In Thiksey monastery you witness the huge Buddha Matriya statue, and several old prayer hall with lots of old paintings, this are dated back to some 800yrs old. Novice monk school and on some occasion there will be a puja and performance. 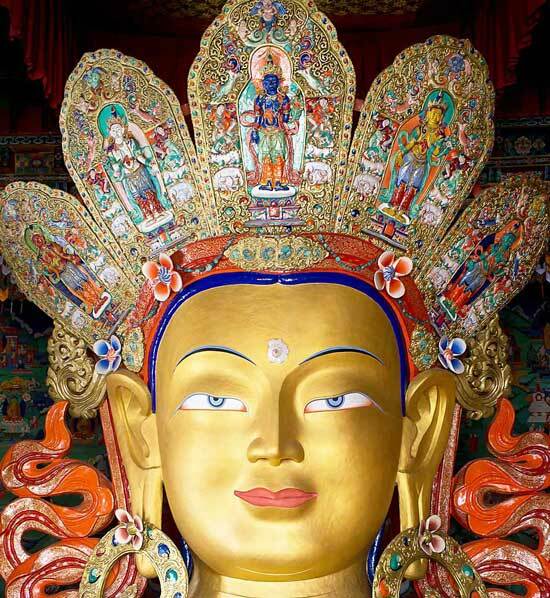 Later drive to hemis monastery the most richest monastery of Ladakh with lots of statues and old paintings. 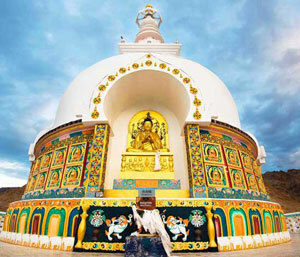 there is a museum with lots of display of Tibetan paintings and murals. later drive back to she castle , it sure to be the summer palace of ladakh’s king Singay Namgyal’s and most of their linage born there. O/N Leh. Early morning transfer to Leh airport to board flight back to destination with sweet memories of Ladakh. Water is the most essential thing while traveling in Ladakh, since dehydration can further complicate health issues at such a high altitude. So make sure you are carrying at least couple of liter of water per person all the time and drinking at regular intervals. Carry Diamox if you aren’t allergic to sulfur drugs (helps reduce some of the symptoms of AMS) and medicines for headache, fever, stomach ache, cold and cough syrup. You can find more detailed list for medicines here, First Aid Travel kit. UV rays at high altitude can be quite damaging to the skin, even during the harshest of winter, so don’t forget to carry a good quality sunscreen lotion eg. Lotus Herbal Sun Screen Lotion with rating of SPF30 or higher and apply it properly before going out in the sun. As mentioned earlier, UV rays at high altitude can be quite damaging and this holds true for eyes as well. So having decent quality UV sunglasses (Fastrack ones are available for as little as Rs. 800) is quite essential, especially if you are traveling early in the season or during winter, when mountain passes have a lot of snow cover and sunlight reflecting from the snow can be even harsher! Dry and cold weather of Ladakh will make your lips dry, which can get quite painful due to cracking and skin coming off, so make sure to carry a lip balm or Vaseline. ♦ Transportation: Innova/Xylo car will be used for up to 6 person. ♦ Cost of incidental to any change in the itinerary/ stay on account of flight cancellation due to bad weather, ill health, roadblocks, bad or any other factors that's beyond our control. ♦ Optional tours, Travel insurance, travel visas and all personal expenses. ♦ Tipping and gratuities to local guides, drivers, and hotel staff. ♦ Any items not specified as included. To book the tour, you have to deposit 15% to 20% of the total tour cost per person as a token advance, 50% of the tour cost has to be deposited 30 days before commencing the tour. Rest of the 50% will be collected on arrival. ♦ HEALTH & FITNESS: Please read carefully our AMS/mountain sickness guide mentioned on the Main page TAB area. Travellers should have a basic level of physical fitness and mobility and must be able to negotiate uneven surfaces, climb stairs and board car and buses. Footprints Adventure requires a written notification prior to booking (by mail) if you have any physical, emotional or mental conditions that may require professional attention during the course of your tour. If you require any special equipment such as a wheelchair you are responsible for providing this on extra cost. Certain elements of our itineraries may not be wheelchair accessible and we cannot guarantee access or wheelchair assistance at our destinations. We reserve the right to decline a potential participant if, in our opinion, they have the potential to affect the health, safety and enjoyment of other participants. Please familiarize yourself with potential travel, health and safety risks in the regions you wish to visit, prior to booking your tour. Please read carefully our AMS/mountain sickness guidelines mentioned on the Main page TAB area before you begain you tour. We are unable to accommodate for women past their 6th month of pregnancy & senior citizen above the age of 80yrs.